Using the Nintendo Network system, you can exchange items with up to 4 other players with the game. This doesn't require the exchange of Friend Codes or coordinating games together; you simply connect to the Nintendo Network and off you go! The exchange system also allows you and the other players to take care of each other's livestock animals and harvest products from them. The Wifi system is cross-region. You can connect to players from Japan and North America. Note: There is a word filter on the Nintendo Network wifi system that will rename your animals to "?????" if the animals' name matches a word in the filter. This is a global-based word filter so names that you don't think could be bad may be considered derogatory in another country. Local Connection for players who are physically near you and want to connect via wireless. Internet Connection for connection with other random farmers using your Internet connection. Internet Connection with Friends (Japanese version) for item exchange with only those who are registered on your 3DS Friends List. In the North American version, this is located after choosing Internet Connection, then Play Friend via Internet. After you choose your type of connection, you can decide if you want to Create an item exchange room or if you want to Search and select a room that another player has created. The only real advantage to being the one who starts the item exchange is that you can decide when your room is full. For example, if you and one other player are waiting for two more players to join your room, you can start the exchange between the two of you instead of having to wait for others to join. Choose by yourself allows you to manually select the animals you'd like to use. Choose Randomly will take a random selection of 5 animals. Choose friendly animals will pick the 5 animals with the highest heart levels. Higher heart levels means the products harvested by the other players will have a high star rank. Choose stressed animals will pick the 5 animals that have the highest level of stress. Other players' interactions will help to lower stress and make animals happier. 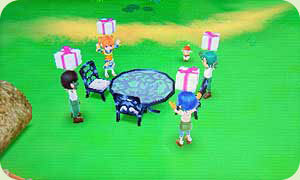 After you have selected your animals, you can select what special item you would like to present to the other players. You can pick an Item such as a crop, flower, milk, and so on, or you can pick a Design Item (blueprint crafted) object that you've made using your Workshop. Not everything can be traded to other players. Tools, farm buildings, fragments, blueprints, or clothing outfits cannot be traded. You can trade fabric for making clothing, seeds, crops, lumber, cooked dishes, and other items. Once you picked your gift item, the player selection will begin. If you made the item exchange room, then you will see the other players' names appear on your 3DS lower screen. If you are simply searching for a room, the bottom screen will list the available rooms and the number of players currently in each one. It's a good idea to pick a room with only 1 or 2 players in it. If you try to join a room that is full, you will receive a 006-0XXX ERROR CODE from the Nintendo Network, which is a vague notification that the room you tried to access is no longer open to new connections (e.g., it reached 4 players before you could join). If you are searching for a room and none appear, press the Y button to search again. When all 4 players are together the Harvest Sprite, Aaron, will start the exchange. He will take the gifts and randomly distribute them to each player. The game will tell you what item you received, but not who you received it from, and then you'll be transported to Animal Land. In Animal Land you will find your selected livestock and the livestock of other players. You won't find any chickens, just sheep, cows, and the like. Press the right shoulder button on the 3DS to select the Brush, Milker, or Clippers. 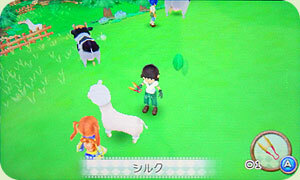 You'll need to have these tools in your actual game before you can use them in the Nintendo Network Animal Land. If you don't have the Milker yet, then you can milk the other players' cows! All of the other players will be doing the same; milking, clipping, and brushing the other animals in the pasture. You won't see the other players making the tool action, they will appear to be standing there doing nothing, but they are interacting with the animals. When you press the Y button, you can select a few emotes that the other players will see, such as hearts and sweat-marks. The animals in Animal Land may be different sizes. You will see normal-sized animals and you'll also see large animals, which are just a little bigger than the regular ones. A large animal is one that has been given enough treats by its owner to produce 5 items at once and has a friendship of 9 hearts or more. When you're finished collecting all the items you want, talk to Aaron by the Animal Land building. He will give you the option to put collected items in your Storage Box (in case you've filled up your rucksack), take items out of your Storage Box, access Aaron's help files, or disconnect from the item exchange. When you disconnect, you will save your game and then you can start a new exchange or return back to the title screen. All of the items that you've collected from the animals in Animal Land will be in your rucksack (or Storage Box if you utilized it) when you load your save game. 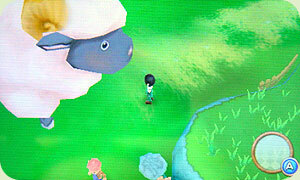 Every so often in the item exchange Animal Land you'll come across a super-sized animal! These animals can be harvested five times instead of just one time like the rest of the animals. You'll collect "great" quality products from these gentle giants, such as Great Suffolk Wool, Great Jersey Milk, and so on. If you have a 4 players exchange, the chance of finding a super-sized animal is 20% and the chance is less when you have fewer players; 3 players is 15% and 2 players is 7%. Every so often you can see a giant Chick, but it doesn't do anything but watch you with its beady eyes. The item exchange is very handy for collecting animal-based materials that you need for items crafted in your Workshop. It allows you to craft items using other players' products without having to collect them from your own animals. Sometimes you can also get awesome gifts from the item exchange, such as a hatchable Silkie Egg before Neil sells Silkie Chickens at his shop. You can even use the collected wool, turn it into yarn by using your Yarn Maker machine, and then exchange it for clothing outfits from Yuri without having to wait to harvest the wool from your own sheep. When you return to your main game, any sheep, alpaca, or llama you own that visited the network Animal Land will have its wool clipped.